Weddings are about planning and details. So we can get to know your and your wishes, we have a free Albuquerque Wedding Flower Consultation. During the consultation, we will discuss your budget, design ideas, and expectations. Plus, we will answer all your wedding floral questions. To get started, click on the form below. Select your day and time right online! Our experienced Wedding Flower Specialists are here to help make the flower part of your wedding stress-free. You can also call us at (505) 338-0038 to schedule your consultation. Proudly serving Albuquerque and New Mexico for more than 40 years! How Far Ahead Should Schedule? Try to schedule your wedding flower consultation several months (7-8) before the wedding date. However, we can work with shorter notice if necessary. The first consultation appointment usually takes the most time, lasting anywhere from 45 minutes to an hour-and-a-half. Additional meetings may take place if anything needs to be changed. Our wedding flower consultations are free. As well as the Bride, it's a good idea to bring along anyone who is involved in making major decisions about the wedding (Groom, Mother, Bridesmaids). Bring any photos of ideas you have for your flowers, including color schemes. It's also helpful to bring a color swatch that matches the colors of the wedding and/or the bridesmaid dresses. Also, bring any charms or decorations that need to be added to a bridal bouquet or boutonniere. Some brides bring notes or a wedding planning guide to help them get organized, so if you have one, bring that too. 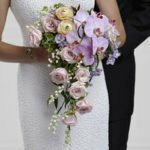 What is a Wedding Flower Proposal? A proposal is an estimate that lists each item used for each part of your wedding and reception, along with costs. This list may change as you fine tune, but before your wedding, it will all be finalized in a formal agreement. How do I Book You As My Florist? Once you are happy with your proposal, we will book your wedding. Simply place a deposit and you will get a Wedding Contract with all the details and costs confirmed in writing. We can work with all budgets, but it's a good idea to have some sort of idea of how much money is available to spend and what not to exceed. To get an idea of pricing, visit our Wedding and Event Flowers shopping pages. A pre-consultation checklist can give you a general idea of the flowers you may want for your big day. Use one you already have, or download one here: Wedding Flower Checklist.